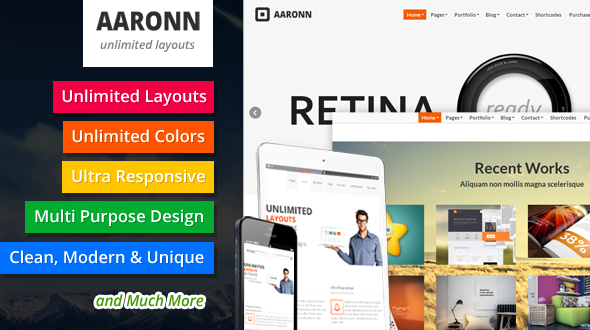 AaRonn is Unlimited Layouts, Unlimited Colors, Ultra Responsive, very Clean & Unique Multi Purpose WordPress Theme that is suitable for any kind of business, group or personal.
. 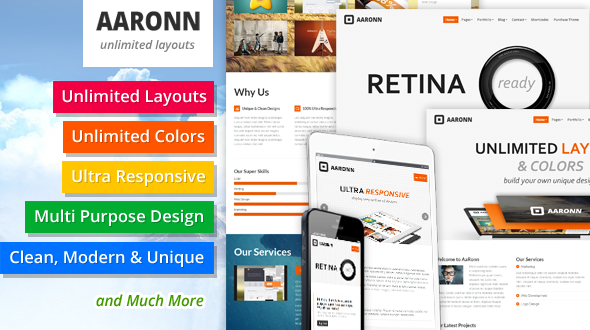 Unlimited Layouts, you can create your own unique layouts using our very Strong & Mixable Shortcodes.
. Ultra Responsive, AaRonn can display very well in any devices (Desktop, Laptop, iPad, iPhone and others).
. Many Layouts for Blog Page (Posts Listing Page).
. Many Layouts for Portfolio Page (Projects Listing Page).
. 2 Layouts for Single Project Page.
. Full Width or Sidebar Layout for Contact Page.
. Tested for Compatibility with Most Popular Plugins: Contact form 7, WPML, qTranslate, All in One Calendar, Events manager Pro, WooCommerce, SEO by Yoast, All in One Seo Pack, W3 Total Cache, WP Super Cache, JetPack, Luv Comments, Disqus, Geo Post, Ultimate Maintenance Mode, Jooseok Oh, NextGEN Gallery, etc.